GARDAÍ HAVE WARNED motorists to take extra caution on roads over the Easter weekend. Met Éireann has said a hail and thunder risk will persist today and over the weekend. An Garda Síochána said 36 vehicles were involved in 12 incidents between 2pm and 8pm yesterday. 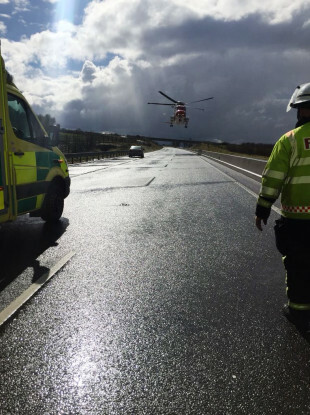 One person had to be airlifted to hospital as a precaution after a collision on the M7. Gardaí warned that there may be treacherous driving conditions as a result of the weather. Chief Superintendent Finbarr Murphy of the Garda National Roads Policing Bureau said: “Hail showers pose significant risks to road users, particularly on motorways. “Drivers on motorways need to be vigilant and ready to stop when and if necessary, and they need to be able to stop the vehicle safely in order to avoid collisions. Hail showers have resulted in multi-vehicle crashes recently. Please drive to the conditions, reduce your speed and increase your braking distance. Email “Motorists warned about hailstones as gardaí attend number of crashes”. Feedback on “Motorists warned about hailstones as gardaí attend number of crashes”.